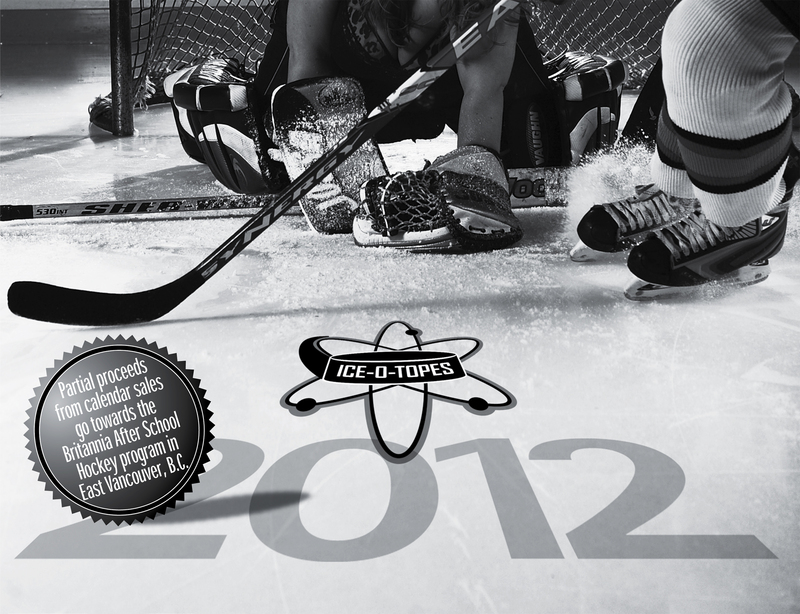 The 2011 Ice-O-Topes Women’s Ice Hockey Calendar is now available! We’re pleased to announce our 2012-13 women’s hockey calendar is now available! We also have moved to a brand-new website that has a shopping cart if you would like to purchase online. They’re still only 20 dollars each and partial proceeds are going to the Britannia After School Hockey program. The new site is here. The Vancouver Ice-O-Topes is a women’s ice hockey team that plays in Division Two in the ASHL at Burnaby 8-Rinks in British Columbia, Canada. Last year the players decided to pull together a team fundraiser with partial proceeds going to the Britannia After School Hockey program which provides underprivileged teens in East Vancouver an opportunity to get into skates and learn the game. The calendar was a big success and sold out. The 2011 version is even better than its pin-up themed predecessor as this coming year’s edition features members of Vancouver’s Little Guitar Army, the city’s homeless soccer team (Vancouver Portland FC), a cabana boy and more! Once again, partial proceeds will go towards BASH (last year we raised 1,000 dollars and donated a bunch of gently used gear. On that note, if you have gear sitting around, unused, contact us so we can get it to BASH. Or, if you like, drop it off at the East Van rink yourself, to Jay.). To purchase a calendar, click right here. Calendars are also for sale at Sports Exchange (2151 Burrard Street, Vancouver BC). Other stores in and around Vancouver will also be stocking them. Check back here for more information. The Ice-O-Topes were featured in the Nov. 10th, 2010 edition of the Vancouver Courier. Check it out here. UPDATE: Meet the Ice-O-Topes Dec. 11th at Toby’s Pub and Grill (2733 Commercial Drive, Vancouver, BC) between 6 p.m. and 10 p.m. Calendars will be available for purchase and signing. Here’s a look at a handful of the 13 months. The players will be hosting a pub night Dec. 11th at Toby’s Pub and Grill (2733 Commerial Drive, Vancouver, BC) between 6 p.m. and 10 p.m. Calendars will be available for purchase and signing. The 2010 version of the Ice-O-Topes calendar garnered some attention earlier this year, having been featured on CTV as well as The Express. Perhaps the oddest experience was when we were interviewed by the popular South American news show Domingo Espetacular (which is, we’re told, the equivalent to the Today Show in the US). Anyway, charming Brazilian journalist Paulo Henrique interviewed some of the Topes about the calendar. He was quite interested in the idea of women playing hockey and even stepped out on the ice to show off his soccer skills. And, well, click here to watch the video to see how that went.